Get a standard Gamla Stan walking tour with ferry and entry to the Vasa included. This tour ends in the Vasa Museum so guests may continue to enjoy the museum or continue to museums nearby. Guests make their own way back via walking or public transport (ticket provided by guide included). Make your way to Stortorget, Stockholm's oldest town square, in Gamla Stan (Old Town) to meet your local guide. Stroll the cobblestone streets and learn about Birger Jarl, the man who founded the city of Stockholm in 1250. Walk through narrow passageways and streets built for horses, not cars, on your way to check out the Storkyrkan (Coronation Church). Admire the statue of St George and the Dragon that stands inside the brick Gothic cathedral. Make your way to Kungliga Slottet, or the Royal Palace, to see the stately architecture and palace guards that surround the place that Stockholm's Royal family calls home. Hop on a ferry for the 10-minute ride to Djurgården, a small island where the Vasa Museum stands. 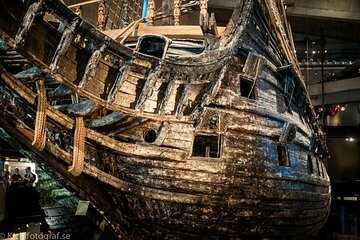 Take a half-hour tour that shows you the highlights of the ancient ship, sunk in the waters off Stockholm in 1628 during its maiden voyage. Explore the ship itself, watch a short film in the museum and then enjoy a coffee in the restaurant. Finish your tour at the Vasa Museum, where you can continue exploring on your own. The guide Sean, was very informative and fun, he is good story teller. I loved this walking tour, if you visit Stockholm you should definitely book this tour. Christof was a great guide and took us all over Gamla Stan and to the Vasa. He was very personable, answered a ton of questions for our group and you will enjoy yourself on this tour. Book it with confidence! Anna took us on a wonderful informative walking tour of the Old City. We then went by ferry to the Vasa Museum. It was incredible to see this amazing ship, resurrected from its sinking site. Can highly recommend OurWay tours and Anna. The tour guide was well informed. Really enjoyed the Vasa Museum. The return afterwards was a little confusing and not easy to get back to our Cruise ship. Her directions were not clear. We loved our tour! We were late (due to needing to find parking - yikes!) but Marc, our guide, was wonderful, called to check on us, then kept in touch until my three sons (ages 8 and 4) and I caught up with the group. He was funny, informative, slow enough we could all keep up walking but not so slow we got bored. The boys learned a lot about Stockholm and it's history, even enough about Mr. Nobel that they recognized him at a completely different museum a week later, and Marc was amazingly patient with their constant questions/comments. We will be back to Stockholm again and hope to schedule another tour with Marc and his agency. My husband and I really enjoyed our tour. The pacing of the tour and facts were just right. Anna was very pleasant, genuine and knowledgeable. Her love of the city was infectious and we learned a ton. Anna connected very nicely with all members of the group, and made sure our needs were met. I listened to other tours around me - they felt very robotic and detached in comparison. I highly recommend Ourway - this walking tour of Gamla Stan was a wonderful way to kick off our stay in this beautiful city. The trip was enjoyable due to a wonderful guide. It was a quick overview of Old Town and then a quick trip across to the Vasa Museum. We enjoyed that transportation was provided to and from. At points it was tough to hear our guide due to noise around town --- that's our only real complaint here. Otherwise, a nice tour. Walking tour was OK - not as good as previous walking tours. You can do the Vasa Museum on your own and listen to tour free at the Vasa museum. This museum is a MUST SEE! The individual who led this excursion was knowledgeable of the facts for the excursion but was not properly trained on how to deliver the information. Stockholm is experiencing growth and is extremely noisy. The person who led this trip had a soft voice adn could not be heard. by anyone. To further complicate the issue she stayed in areas that were extremely noisy. The agency providing the tour should work to provide listening devices and better training. Excellent guide but very short time at Vasa Museum. Vasa is very big museum where you can be all day, it's amazing.